I've set the requester as mandatory when opening a ticket. But if I don't set one the ticket is still created. 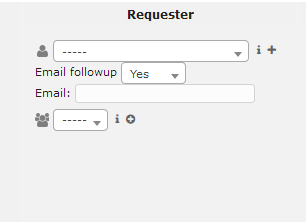 I assume this is for when the requester has no user in GLPI so you can input the email? But I tried creating a ticket with no requester user and I didn't touch the email input. And the ticket was created with no requester email and no requester user. Here's what the print_r on alternative email returns. Edit: I understand that this should error because no user or email has been provided. Edit 2:I also tried "Email followup No"